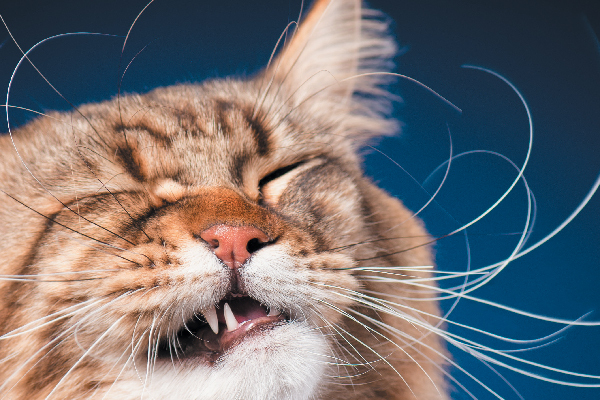 Whiskers are so much more than a beautiful facial feature to enhance a feline’s good looks. They are nature’s amazing version of a radar/early warning system that literally guides every step a cat takes. As a result, cats are capable of truly amazing feats such as walking on ledges, gauging and jumping distances and squeezing through narrow spaces. Never cut or pull on your cat’s whiskers. Photography ©fotostok_pdv | Getty Images. 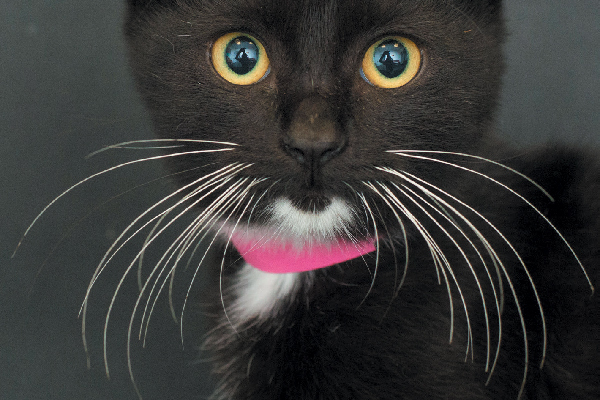 The veterinary term for whiskers is vibrissae from the Latin word vibrio, meaning “to vibrate.” These long, stiff hairs project outward prominently on the muzzle on either side of the nose and on the cheek area. If you look closely, there are also shorter whiskers protruding from under the chin, above the eyes (the feline version of eyebrows) and also at the back of their front paws, known as carpal whiskers. While whiskers are usually straight, they can also be curly. All whiskers, wherever they are located on the body, have very delicate sensory “feelers” or touch receptors at the tip. These are called proprioceptors and are designed to send tactile signals to the brain and nervous system. These delicate hairs also respond to vibrations in the air. Consequently, this kitty radar system allows them to detect even the smallest changes to their immediate surroundings; to make quick, safe decisions with regard to their next immediate movement; and gauge whether they can jump a certain distance by visually measuring the distance, fit in a narrow space and walk on a pencil-thin ledge, even in the dark. And they assist a cat when he’s in hunting mode to catch prey and still remain out of harm’s way in the process. Consequently, whiskers should never be cut or pulled on. Also, because of the “work” they do to keep a cat safe, they are extremely sensitive even to playful touch. So, cats prefer if you look but don’t touch. A black cat whisker closeup. Photography ©Casey Elise Photography. Apart from being a highly accurate guidance, tracking and radar system, whiskers also serve as an indicator of a cat’s mood. They are immobile when a cat is sitting or lying contentedly in a favorite snooze zone. They can bunch up and flatten against the face indicating a potential danger and, hence, fear of a pending situation. When every hair on the cat’s body and tail also fluffs out, giving the appearance that the cat has doubled in size, it’s a sign that a cat believes himself to be in real imminent danger. When the whiskers “swivel” and point forward, it is a feline sign of going into hunting mode, even if the “prey” is a favorite toy. 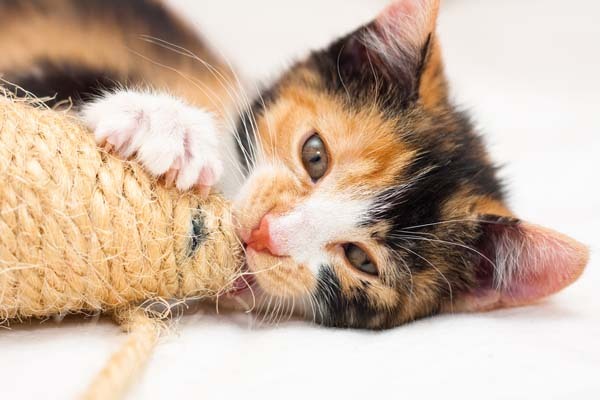 What is whisker fatigue or whisker stress? 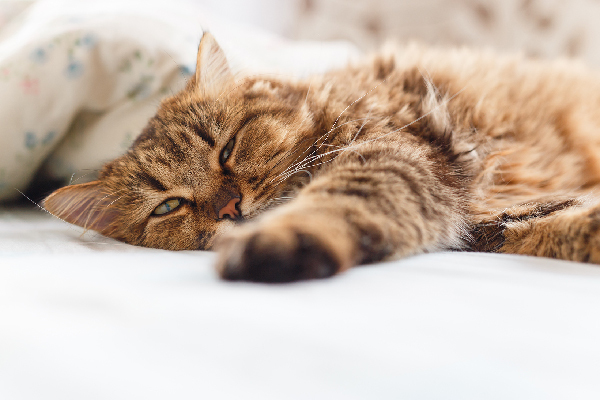 What is whisker fatigue or whisker stress? Photography ©Holly Hildreth Photography. 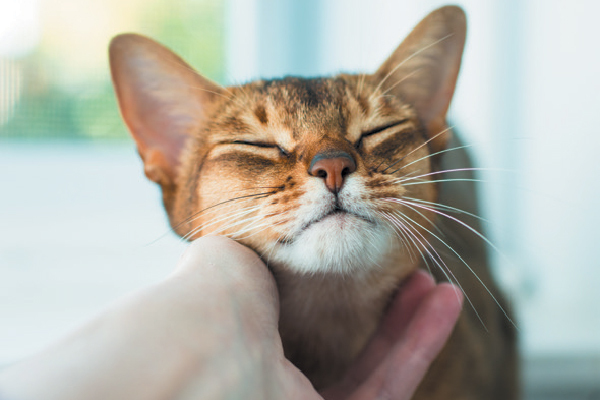 Some people believe that cats fed meals in small bowls may suffer from whisker fatigue or whisker stress, when the delicate whiskers are in constant touch with the sides of a bowl. There are even several food bowls on the market designed to take the whiskers into account when a cat is eating. What myths are associated with cat whiskers? 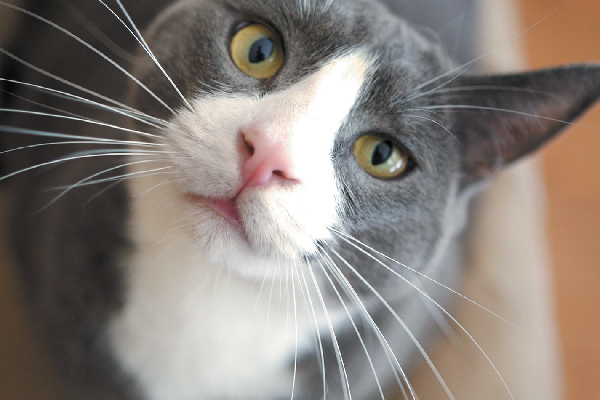 There are a few myths surrounding cat whiskers. Photography by Casey Elise Photography. While there are lots of myths surrounding cats in general, there is no definitive myth surrounding the whiskers. Some people believe that if a cat loses a whisker, picking it up and keeping it will bring luck. (They do grow back!) The idiom “to be the cat’s whiskers” means to be better or superior to everyone else. 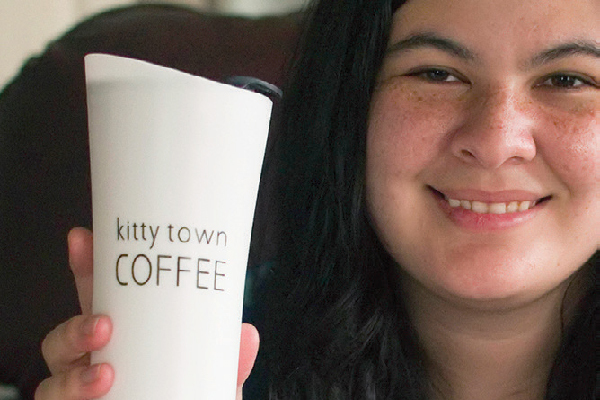 It’s similar to being the cat’s meow, the cat’s pajamas, the bee’s knees or the best thing since sliced bread. 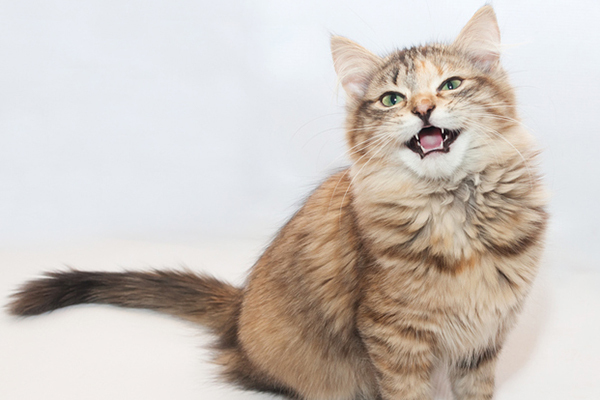 It all makes a lot of sense; cats are superior — even dogs know that! No animal has an innate radar system quite like a fabulous feline. 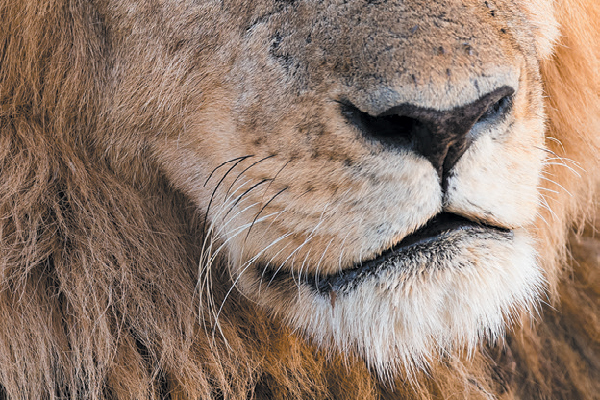 Lion whisker closeup. Photography ©pchou | Getty Images. According to zoologist Joanne McGonagle, big cats such as lions, tigers, snow leopards and other wild cats also have long whiskers that, just like their Felis catus domestic relatives, can sense objects even without making physical contact. This gives the big cat a signal of where to inflict the kill bite when taking down prey. Joanne, who is also the founder of Triple T Studios, an online store that supports global big cat conservation projects, adds that it’s possible to identify a lion from the whisker spots that are found in rows on each side of the face. Thumbnail: Photography ©Amelia Soper | www.stockpetphotography.com. Can someone tell me the breed of this gray/white cat on the cover of the July/August 2018 issue of Catster Magazine? Thank you. That photo is from a stock photo service, but by the looks of it, he or she seems to be a mixed breed. 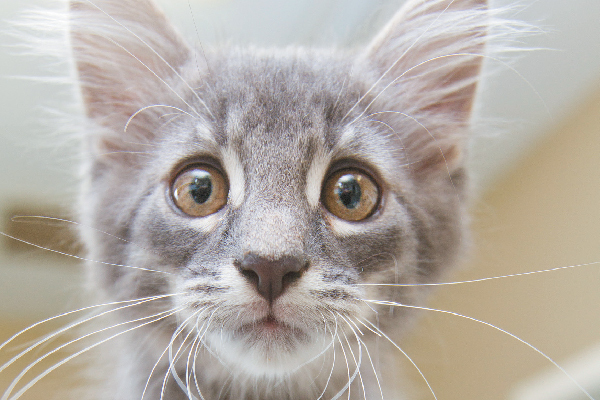 You could probably find a similar gray-and-white cat up for adoption at your local shelter!